After lunch, the girls and I hopped on the subway and headed to the Canada Day events hosted at Queen’s Park. We ended up having a great time – there were free bouncy castles, live music, hula hoops, and more. 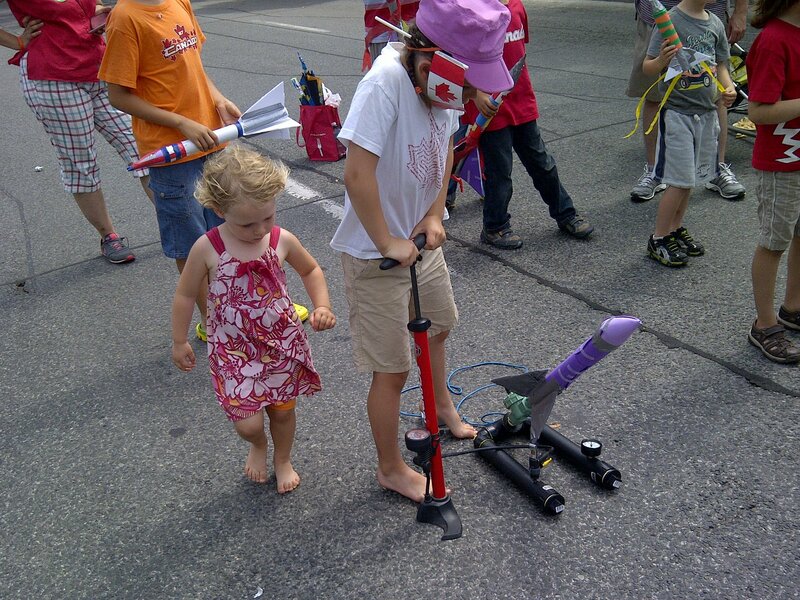 But I thought the coolest activity was the build and test your own air rocket, hosted by Makerkids. The children were given pipe insulation for the rocket’s body, and duck tape, scissors, cardboard, streamers, and everything else you would need to complete an air rocket. With occasional help from Rachel, Tegan built her rocket. The Makerkids team had several launching stations setup on University Avenue, which appeared to be similar to the Make design. As scotch tape was used for some of the cosmetic touches, I warned Tegan that the rocket may not survive its first test flight intact. She decided to launch it anyway. See the video for the test flight results.